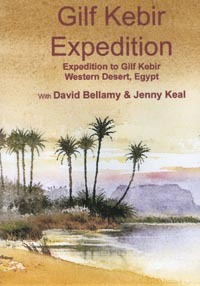 In October 2006 we joined an expedition to the Gilf Kebir, a high plateau in south-west Egypt on the borders with Libya and Sudan. An area too arid even for camels, it is a serious undertaking as there are no communities or rivers: all water for over two weeks in the desert had to be carried there. There is much rock art in the area, including the Cave of the Swimmers, made famous in the film The English Patient, with even more just across the border in Sudan’s Jebel Uweinat. The area saw much activity during World War II when the Long Range Desert Group set up bases and airstrips there, and there is still much evidence lying around in the form of burnt-out trucks and 4-gallon vintage petrol cans. 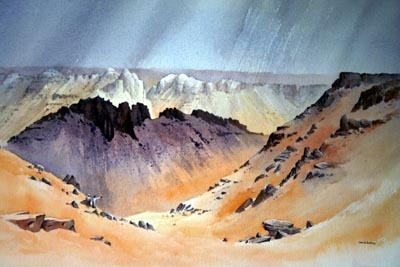 We carried out a great number of sketches, although most of the group were not artists, and we were constantly entertained by the dancing of the support team led by Mohammed Marzouk, with whom I’ve been on expedition before, and one of the best guides in the Western Desert. The latter part of the trip involved crossing the Great Sand Sea to Siwa Oasis, driving over huge dunes and descending their incredibly steep northern slopes. Naturally some wagons became stuck in the sand at times. It was a fascinating expedition and we’ve produced a film of the expedition on DVD. Although this is not an instructional film, it does show David and Jenny’s methods of working, gives an insight into their motivation and inspiration and shows a number of sketches and paintings from the trip.